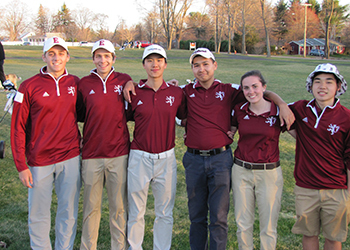 The Golf Team made their 2015 debut on a high note at Deerfield Saturday winning 6.5 points to 3.50 points. This was our first regular season win in many years over an always talented Deerfield team. Leading the Big Red golfers was Daulet “Big D” Tuleubayev, one of the new preps on this year’s squad. Also contributing in a big way with match wins were Charlie Dubiel, Steven Dilisio, Stella Woo and Melanie Allan. Brian Choi halved his match, gaining a half a point. Daulet shot a 71 making him a co-medalist with Deerfield’s Brandon Wu. Charlie Dubiel's 74 was good for second lowest, making the Charlie/Daulet team unbeatable. 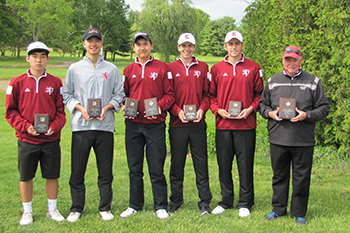 Other scores included Paul Lei with a 76, Steven Dilisio 77, Stella Woo, 82, Brian Choi 83 and Mel Allan’s 86. 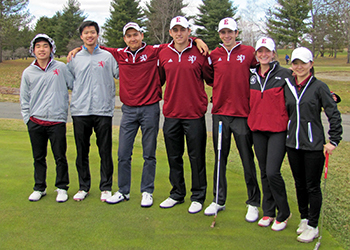 This was the team’s first time on a golf course this spring. Hopefully the weather will hold and we’ll get more matches in this week!!! Wednesday we’ll play The Rams of Tilton Academy and Saturday we travel to face two tough opponents at Loomis and Tabor. 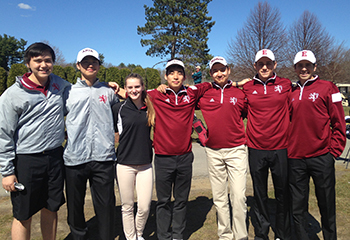 The Varsity Golf Team had their first home match against Tilton at Candia Woods on April 15th. The weather was sunny, the snow had melted and the wind was blowing!! Even in these conditions the team was able to play some good golf and brought home a 10-0 point’s win. Leading the way for Exeter was Upper Steven Dilisio shooting a nice 37. Steven was also medalist for the match. Daulet ”Big D” Tuleubayev continued his good play carding a 39 followed by Charlie Dubiel 42, Paul Lei 43, Hiro Kuwana 44, Andreas “More Money” Moe 46 and in her first match, Lexi Butler shooting 52. All players won their matches. 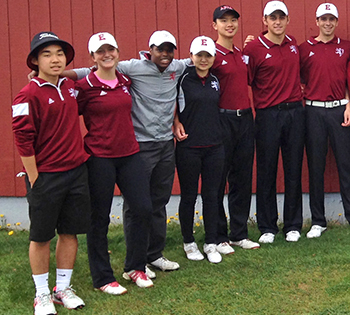 The Golf Team travels to Loomis on Saturday to play two talented teams in Loomis and Tabor. The first T-Time will be 1:40 at the Wintonbury Golf Club in Bloomfield CT. This Pete Dye course will be a challenge for all the players. Last Saturday the Golf Team extended its winning streak to 3 in a row. Playing against two very good teams in Loomis and Tabor the Big Red Team battled the opponents and some very breezy conditions at The Wintonbury Hill Golf Club. It did feel like a spring day with temperatures reaching almost 80 degrees. Leading the way for Exeter was Daulet Tuleubayev who shot a 73 and claiming his second medalist award this season. Steven Dilisio fired a very good 75 playing in the number 1 spot. Paul Lei and Charlie Dubiel turned two good scores of 76 and 77 respectively. Rounding out the scoring was Brian Choi with 82 and Zanny Merullo with a 99 in her first Exeter Varsity match. The team score of 383 was just 2 shots off a record low team score of 381 by Loomis back in 2012 at Wintonbury Hills. The Golf Team came into the Andover Invitational playing good golf and full of enthusiasm and purpose. The challenge would be the Newport CC and the famed winds of Newport. The conditions would take its toll on a very strong field of players from around New England. The winds were blowing 25-30 mph, with gusts even stronger. Just 6 of 40 players were able to break 80 at the seaside links style course on the edge of the Atlantic Ocean. Leading the way for Big Red was Daulet Tuleubayev, shooting an amazing 2 under par 70. This performance earned him Medalist honors for the day. Steven Dilisio continued his strong play shooting a fourth lowest score of the day 79. Captain Paul Lei contributed with a steady 81, Charlie Dubiel added a nice 83 and Stella Woo added a 91 in her first Andover Invitational appearance. In the Team Competition, using the best 4 scores, the Big Red dominated the field finishing with a total of 313, beating the nearest competitors by 20 strokes. Finishing scores were Tabor (333), Andover (338), Loomis Chaffee (345), Taft (346), Deerfield (351), Hotchkiss (354), and Salisbury (372). This was the 2nd Team title for the Big Red in the 15th Anniversary of the event. Daulet joined Anthony “Two-Shoes Dilisio” and Sim Allan in capturing Medalist Honors at Newport. It was great to see fans of the Team show up to battle the conditions to support the golfer’s, Thanks!!! This week’s up-coming matches include a home match Wednesday against Holderness and away match Saturday at Proctor. The three round competition with Andover and Governor’s came to a successful end Saturday at Breakfast Hill. 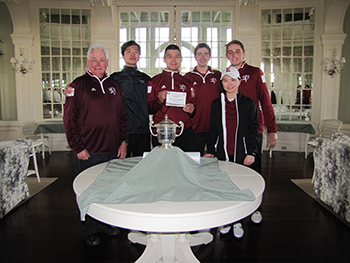 The team continued its great play and battled to victories in the Lovell Cup and Witherspoon Cup. The Witherspoon Cup has been played since 1928 and is a Match Play Event between Exeter and Andover. In this year’s competition Exeter prevailed 9.5 pts to 4.5 pts. Winning both of their matches were Steven Dilisio and Melanie Allan, also winning at least one match were Paul Lei, Charlie Dubiel, Daulet Tuleubayev, Stella Woo and Brian Choi. The Lovell Cup is a three way match in a Medal Play setting over the three matches played. This year Exeter prevailed with a total of 972 strokes, followed by Andover at 1020 and Gov’s at 1092. The Medalist in the Lovell Cup completion is awarded “The Mangan Cup” and this was Charlie Dubiel, with a total of 185 strokes over the 45 holes of golf. A close second was Steven Dilisio at 190. The “Moonves Plate” for Medalist in the first 18 Hole Match at Andover this year was Daulet Tuleubayev. Daulet shot an outstanding 2 under par 70 at Indian ridge. The Big Red finished the regular season with an undefeated season, winning all 13 Matches in heads-up completion. They also won the Andover Invitational and will compete this Wednesday in the season finale “Kingswood Oxford Tournament” against 22 other teams from around New England. As the season came to an end The Big Red Golf Team played in the Kingswood Oxford Invitational Tournament in Feeding Hills MA. 23 of the best private schools from around New England participated in this classic event. Making up the squad was Captain Paul Lei, Steven Dilisio, Chalie Dubiel, Brian Choi and Daulet Tuleubayev. We were confident going into the finale and we brought home a very good 3rd place finish. The conditions would test all the players in the field, as the wind blew strong and steady throughout the day. We fired a good 406 with only Loomis 398 and Westminster 400 playing a little better on the day. The team gave 110% effort and golf is a sport of good and bad bounces. I am proud of their efforts and play at the KIT. We’ll be there again next year and we’ll give it our best again!!! Daulet Tuleubayev was the 2nd lowest score of the day shooting a very good 73 and taking home the 2nd place medalist trophy. Paul Lei finished off a great 4 years at PEA with a solid 79; we wish Paul all the best at Harvard where Red will continue to flow in his veins.